Will the region become more democratic? Indonesia is the world's third-largest democracy and one of its newest. But while Indonesia is consolidating its democratic institutions and slowly making progress against endemic corruption, democracy elsewhere in Southeast Asia is in distress. High-level corruption and politically motivated murders are obstructing democracy in the Philippines. 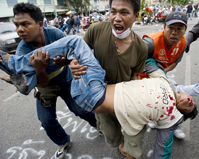 In Thailand, 14 years of turbulent democracy ended with a military coup in 2006. Elections eventually resumed, but after anti-government protesters camped in Bangkok's commercial center for months this spring demanding new elections, the government finally broke up the demonstrations and began shooting and arresting protesters. True democracy is largely a fiction in Cambodia, Singapore and Malaysia, and Myanmar (Burma) is run by a brutal authoritarian regime. Against this backdrop, opposition politicians, scholars and human rights activists debate how best to encourage democracy in Southeast Asia.